It's getting to be that time of the year again...time to switch your child's footwear from tennis shoes and boots to sandals, bright colors, and water shoes!!! No one wants to keep putting socks and shoes on sweaty, stinky feet! 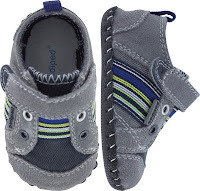 Give those tiny little feet some air but keep them comfortable with the new Memory Foam Technology, Expanded Water-Safe Adventure Line and More than 50 New Styles/Color Options from pediped's new Spring/Summer 2013 Collection! The collection spotlights sweet pastels, sea side nauticals and bright neons to cover every warm weather adventure. pediped is debuting more than 50 new styles and color combinations across the footwear’s three signature lines: Originals®, Grip ‘n’ Go™ and Flex®. The collection highlights over 15 styles containing Memory Foam Technology™. The water-safe, Adventure Line has been expanded to allow kids everywhere to enjoy the outdoors in splashy style. A trendsetting palette of warm pastels, cool blues, rocky browns, and neon brights is featured and as always, the collection parallels the signature comfort of the pediped® fit. No matter the need, the vast variety of Mary Janes, sandals, sneakers and boat shoes, is sure to have every occasion covered. * The Originals line of soft-soled, flexible infant shoes is recommended by pediatricians and podiatrists as the shoe’s design closely mimics barefoot walking. * 11 new styles have been added this season. Highlighting the collection is the Daphne and Betty for those pastel occasions, and the Daisy and Sadie serves as signature styles. For boys, the Aaron and Amazon have all the outdoor needs covered, while the Jones offers the classic sneaker. * The Originals® collection will be priced at $37 and is available for children ages 0-24 months. * The Grip ‘n’ Go™ line is made with all the benefits of the Originals®, but adds special feature G2 technology for the unbalanced toddler transitioning into walking more confidently. * New for Spring/Summer, the collection spotlights Memory Foam Technology™ in the Nikki and Savannah. Also new for girls is the Dakota and for boys, Memory Foam Technology™ is featured in the Joshua. The Gehrig is a new water-safe and machine washable style. * The Grip ‘n’ Go™ line will retail at $48, and will be available for children ranging from nine months to three years of age. * Flex® is the ultimate shoe for an established walker who has developed a confident, natural stride. The Flex® line offers more than 50 styles covering an array of color options ranging from pastels and neons to signature browns and black. * Popular as ever, the water-safe, eco-friendly Adventure Line has expanded with over 10 new styles. Featuring pops of bright summer colors, the Darcy and Amazon, new styles for girls, make their debut alongside the Rio and Gehrig for boys. * The innovative line of washable athletic shoes, made with Ultra Light Technology™, is especially designed to support children’s growing feet. Featuring flex grooves to support natural foot movement and heal cushioning, this line provides maximum flexibility while remaining light as air. The line consists of 15 solar system inspired styles. 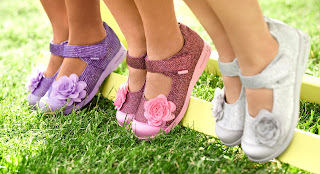 * Flex® styles range in price from $39 to $59 and are available in EU sizes 20-33 (available sizes vary between styles). For both my children, I only choose pediped shoes because of their exceptional quality, unsurpassed comfort and distinctive styling! Plus, they are so CUTE! Every. single. pair. 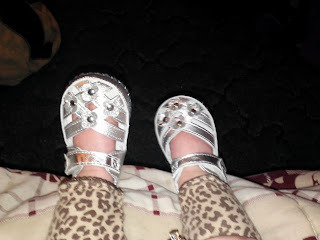 I always have the hardest time picking out a pair for my son and daughter because they are cute, comfortable and stylish! Most importantly, I trust them for my children's growing feet because pediped® footwear has been awarded the American Podiatric Medical Association Seal of Acceptance for the promotion of healthy foot development, and preeminent orthopedic medical professionals, Dr. Mininder S. Kocher and Dr. Thomas W. Vorderer, deem pediped® shoes an excellent choice for parents/caregivers who want their children’s feet to develop naturally and healthily. 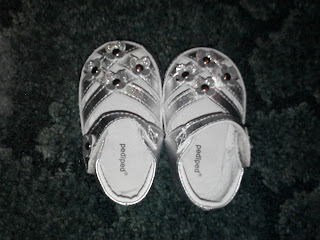 My son learned to walk and run in pediped shoes and so will my 1 year old daughter! And don't forget to sign up to become a pediped Insider on pediped.com to be the first to know about new product introductions, special promotions and more! Also, if you like pediped make sure to check out Brian James Footwear, www.brianjamesfootwear.com, the new women’s footwear line from Angela Edgeworth founder of pediped. Buy It: You can purchase pediped's Spring/Summer 2013 Collection online at www.pediped.com.